Fintechs have always been at the forefront of technological advances in the financial services industry. As artificial intelligence (AI) software becomes more mainstream, fintechs are once again showing the way forward by leveraging AI. In this article, you’ll learn how fintechs are leveraging AI to bring down cost, provide better customer service and detect fraud. The ability for a bank to offer custom services to every level of customer is no longer an option. It’s a requirement. But it often isn’t humans who are providing such services. It’s AI software. One company getting in front of them is Grifin. It analyzes where you spend and provides suggestions for investing in those companies. “Today’s technology provides a gateway for companies to do some pretty amazing things. As well, traditional banking and investment channels aren’t moving fast enough with the industry. They are falling too far behind and are losing their current user base. By the time they adjust, the needs of millennials will already be taken care of by fintech companies,” Aaron Froug, the company’s co-founder, told Forbes in an interview. Another area of financial services that is being automated through AI is financial advising. Rather than interacting with a human, customers use robo advisors — AI software that suggests investments based on your answers to a set of questions. Fidelity Go is one such robo advisor. Some of its main benefits are lower fees than that of a human advisor and its ability to quickly scan a broad range of investments that are tailored to a specific person. Unlike stand alone-apps, chatbots are AI software that integrates with SMS, Slack, or Facebook Messenger. In other words, they work on platforms you’re likely already using rather than requiring you to install another app. Chatbots utilize existing platforms to send useful messages related to your finances. Depending on what the chatbot has been programmed to do, it will monitor your financial behavior and assist with different tasks or provide suggestions. Trim and Truebill are great examples. Both help you save money by monitoring your financial activity. For example, when Trim finds a way to save, it sends a text message asking if it can perform a specific money-saving task. Once you confirm, Trim goes off and completes the task. Truebill tells you if you electrical or phone bill looks too high, and offers to negotiate on your behalf to lower your bills for you. For business owners, Taxbot is a chatbot that tracks your mileage and business expenses. By utilizing GPS, Taxbot is able to track and provide plenty of detail about each business trip. It tracks other expenses through photos of your receipts, which it can match to bank or credit card charges. Fintech isn’t just small, nimble companies. Big banks have departments within them or even fintechs they’ve bought up that perform the same tasks. At JP Morgan, by leveraging AI, they’ve created a technology called Contract Intelligence (COiN). COiN is able to scan 12,000 annual commercial credit agreements in a matter of seconds. This task used to take 360,000 manual hours. Wells Fargo has also created a large AI group within the company. They recently developed a customer service chatbot that works on Facebook Messenger. Unlike some of the other chatbots mentioned earlier, Wells Fargo’s chatbot interacts more heavily with customers. It is able to do things such as help to reset passwords and provide account information. These are tasks that use to be performed by human customer service employees. By removing humans from these tasks, Wells Fargo is able to decrease its overhead cost. Traditionally, security software helped to determine possible fraudulent activity. It then took many hours of investigation by humans to determine the severity, if any, of the detection. By the time any verifiable conclusion was reached, it could be too late. Detecting fraud isn’t straight forward. The act of fraud is very subtle and almost invisible. AI and its close cousin, ML (machine learning) are helping to turn the tide. 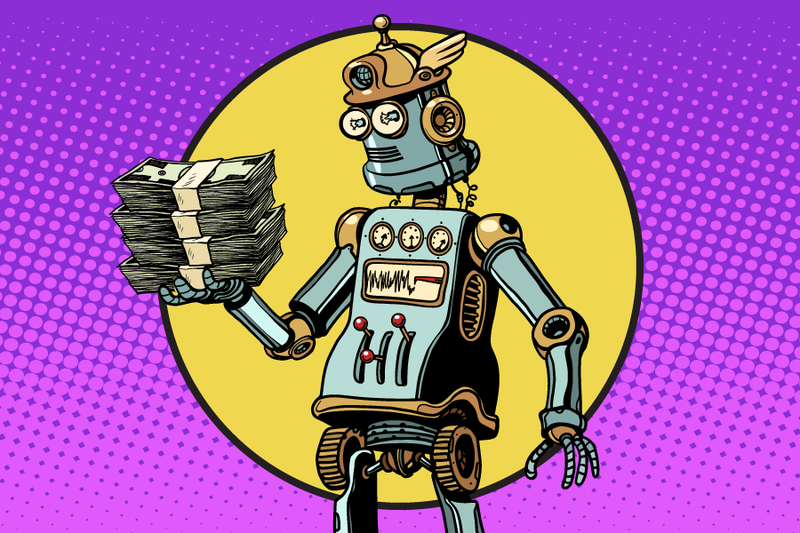 Because AI and ML are able to analyze historical transactions much faster than humans and provide fairly accurate predictive results, fraud can be determined or at least narrowed down to a smaller set of possibilities faster than ever before. As more transactional data accumulates, AI and ML fraud detection software will only get better. The reason why is because the software constantly trains and learns what is regular financial behavior vs. what is fraudulent. Fintechs are no longer stand-alone companies creating the latest financial services solutions. Many of them are well-funded groups within large financial services firms. One thing they all have in common is a drive to keep innovating and moving the financial services industry forward. AI is one of the main tools fintechs are wielding to accomplish this tasks. Worry-free bill pay for you&me, and your business.